Generally clear skies. Low 61F. Winds N at 5 to 10 mph..
Generally clear skies. Low 61F. Winds N at 5 to 10 mph. Lisa O’Connor and her daughter, Clairelise, were waiting for an abandoned horse to be delivered to Sunrise Horse Rescue on Aug. 1. It seemed appropriate — a new home for a new horse at the start of a new month. The “new guy,” who has yet to have a name, was found about three weeks ago roaming Soda Canyon. For the past two weeks, he was living at the Napa County Animal Shelter and officials there estimate he is about 300 pounds underweight — just skin and bones — and they say it’s the worst case they’ve seen in 27 years. A new stall, deeply bedded in wood chips, and a large pasture area were waiting for the “new guy” at Sunrise Horse Rescue, O’Connor said. Once there, the new arrival will undergo a complete exam by the horse rescue’s team of veterinarians and will get the best care possible. O’Connor estimates it will take a while for him to gain weight and to feel better. “Because he is so underweight, what we will do is feed him small amounts several times a day,” she said. Depending on breed, an average horse will weigh 1,200 pounds. Along with food, which has to be soaked to an oatmeal consistency because of the poor condition of the “new guy’s” teeth, he will get supplements as do most of the other 14 horses who have found a permanent sanctuary at Sunrise Horse Rescue. “Knowing that he is here with equine friends will make him secure, content and happy,” O’Connor said. “It is hard on a horse to be out alone (in the wild.) Horses are herd animals and they need their friends to be secure. “We think he is going to bond with a couple of our older guys here,” she added. Although the vet has estimated the “new guy’s” is between 20 and 30 years old, he won’t be the oldest horse at the facility. 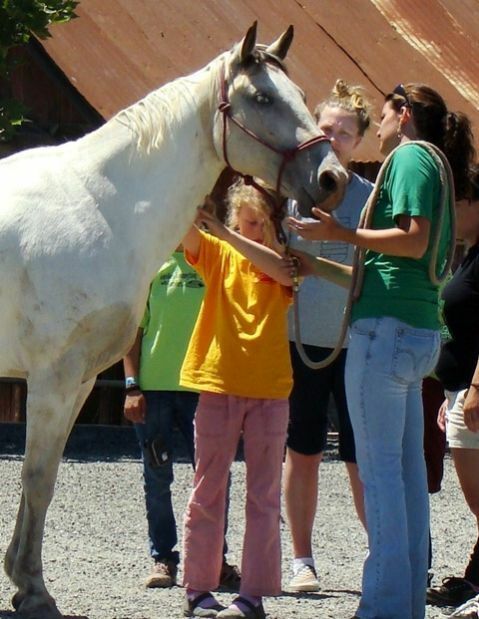 That honor belongs to Captain, about 40, who could well be the oldest horse in Napa County, O’Connor said. The arrival of the latest resident is bittersweet. Recently Sunrise lost two of its residents, Strider and Molly, who were both about 18 years old, but now there is roomto care for another rescue. Along with a recent arrival, Finn, who was profiled in the Star in mid-June, the board of directors, two paid staff members and many volunteers care for 15 horses at the Lodi Lane sanctuary, founded in November 2007. O’Connor said there is a regular group of about 30 volunteers who come in daily or weekly to feed the horses either two or times a day (a paid employee feeds them at 6:30 a.m. on weekdays), turn the horses out of their stalls to exercise them, walk them and groom them. The volunteers will be a highlight of the group’s fourth annual dinner and benefit auction, “Harvest of Hope,” at 5 p.m., Saturday, Aug. 17, at Blossom Creek Farm, 3547 Hwy. 128 in Calistoga. One of the nonprofit’s mottos is: Who is saving whom? O’Connor said, adding that Sunrise Horse Rescue is not just about the horses, but rather the volunteers who also benefit from their experiences working with the horses. When guests arrive at Blossom Creek Farm, they will be greeted with a glass of sparkling wine and an opportunity to meet the rescue horses. “We will trailer the horses over the day before, they’ll sleep over and they’ll be there the following day to greet the guests when they arrive,” O’Connor said. The evening will include live music, a silent auction, a natural horsemanship demonstration by Matt Brown, who is hoping to make the 2013 Olympic Equestrian Team. Michael Grigg from Bakersfield will run the live auction. “He has a lot of positive energy,” O’Connor said, “and good suggestions for a successful event.” Beyond that, Grigg has toured both Blossom Creek Farm and Sunrise Horse Rescue and has met their horses, so that will make it special. A seated, five-course family-style dinner will be catered by Napa’s Kinyon Catering for the second year and the live auction lots include an East Coast equestrian adventure, an African safari, trail rides with Triple Creek outfitters, spa treatments at Meadowood, an original painting by noted artist Matt Rogers. Other than a $15,000 grant the organization has received for the past four or five years, event proceeds supply nearly 100 percent of the nonprofit’s “bare-bones” budget, about $90,000 annually to care for its horses. 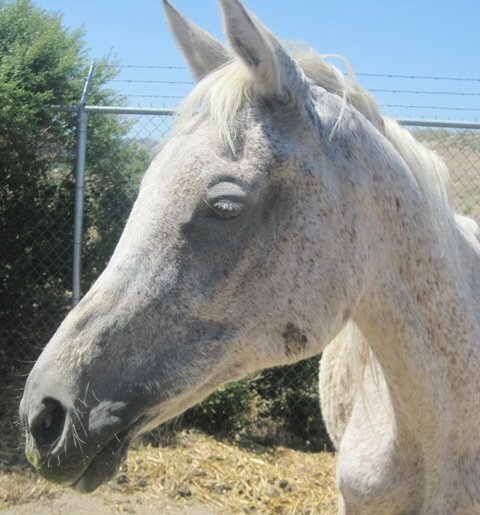 O’Connor noted that unexpected expenses, such as a surgery needed for a horse, come out of the budget or the organization will seek additional donations from its supporters. O’Connor, who has served as board president for the past year, said they provide their horses with care by a highly-qualified veterinarian team, no matter what the cost. “We do what is best for the horses,” she said simply. One of the nonprofit’s goals is to find a new home for Sunrise Horse Rescue, at least 10 acres but preferably 20, in the Upvalley area where most of the volunteers live. A permanent barn structure with adequate pasture lands is needed so the horses can be turned out during the day and brought in at night. It won’t be easy to find the land and raise the funds needed to buy it, O’Connor said, but the event’s Fund-A-Need lot proceeds will go toward a new home. O’Connor’s hope is to find and purchase new land by the following year. After that, it will take two or three additional years to get the raw land ready for the horses.